Eating on-the-go is a way of life for most people. We are busy, and we don't apologize for it. With that lifestyle come certain compromises that we otherwise would prefer not to make. For instance, we may opt to eat fast food rather than a home-cooked meal. And when we grab that fast food, we are also likely to grab a plastic fork or spoon to eat with. 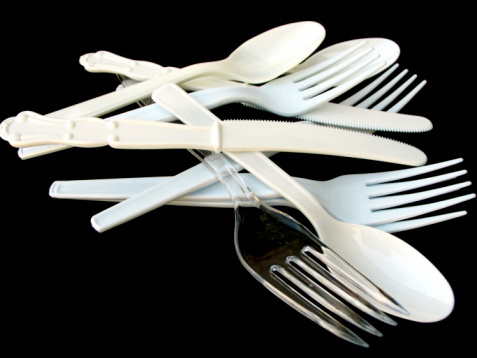 No matter how you look at it, plastic utensils result in a lot of waste. Whether it relates to recyclable goods being tossed into the rubbish, the packing materials the utensils come in, or the manufacturing process required to make the plasticware, there is waste involved. The typical plastic spoon or fork, just like the ones you pick up at your local deli or fast food restaurant, is made from petroleum. When it comes to the length of time it takes for a plastic spoon or fork to decompose, online resources vary greatly; the range found is between 10 and 100 years with a maximum of up to 1,000 years. Of course, it should be remembered that while the material is decomposing, it is releasing unhealthy substances into the earth. The word "farm" often conjures up images of pigpens, silos, and acres of corn, not urban “farmers” living in a city. Building an indoor kitchen garden doesn't have to cost a lot of money. It can be as simple as a few pots on shelving units near the windows, or it can be as elaborate as you wish with heat lamps and UV lighting. There are many bonuses to investing your time into cultivating an indoor kitchen garden whether you are looking to increase the "feeling" of the room or would just like to add fresh ingredients to your cooking. Yesterday Farmigo announced that it has launched the first ever online farmer’s market! The online farmer's market is designed to connect communities such as workplaces, schools, or community centers to local farms. This will help them provide a personalized online farmer's market allowing people to purchase local, fresh food. The first food communities are starting off in San Francisco and New York. Los Angeles, Seattle, Portland, Denver, Chicago, and Philadelphia will be rolling out soon. Cheese begins with milk, as most people know. But vinegar is a key ingredient that really gets the process going. Vinegar is what encourages the milk to curdle and give cheese an acidic flavor. Before vinegar, bacteria was used to produce the acid. Using bacteria is a lengthier process and the cheese continues to increase in flavor as it ages. Some of the most expensive cheeses are still made with acid-producing bacteria instead of vinegar. Of course, we all know the environmental benefits of eating locally grown food. In much of the country, it's still tricky to eat locally year round. It's tricky, but not impossible. Become a seasonally savvy shopper and learn what’s in season in your neck of the woods and when. This makes it easier to shop for local food. Epicurious has an easy-to-use map, making it quick and simple to learn what’s in season. You can even click on the list to get recipes in case you're stumped. Whole Foods Markets often have locally grown produce, even in the winter. Many of these items come from local greenhouses and root cellars. Even if the local produce pickins are slim, Whole Foods Markets often has other local foods, such as meat, baked goods, tomato sauces, ice creams, and more. Every Whole Foods Market in the North Atlantic region has a Forager. Kathleen Connolly, Forager at the Newton, Massachusetts Whole Foods Market explains: "Every Whole Foods Market in our region has a forager whose duties, in addition to their everyday responsibilities, are finding local companies whose goals and mission are similar to ours and helping them bring their product to sell at Whole Foods." Our friends at Easy Finance look at some different stats for the finances of going green and saving money. They go on to explain: "There are a number of ways to help our environment almost effortlessly and without spending a single dollar. Some principles of a sustainable lifestyle are pretty straightforward and easy to put into practice."